“Throughout history the world’s greatest conquerors have made their mark not just on the battlefield, but in the societies they have transformed. 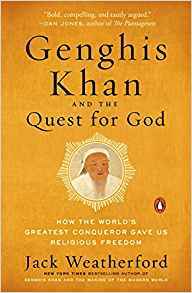 Genghis Khan conquered by arms and bravery, but he ruled by commerce and religion. He created the world’s greatest trading network and drastically lowered taxes for merchants, but he knew that if his empire was going to last, he would need something stronger and more binding than trade. He needed religion. And so, unlike the Christian, Taoist and Muslim conquerors who came before him, he gave his subjects freedom of religion. Genghis lived in the 13th century, but he struggled with many of the same problems we face today: How should one balance religious freedom with the need to reign in fanatics? Can one compel rival religions – driven by deep seated hatred–to live together in peace?